The article is presented by CUT Camps; all opinions are those of the author. Please support the brands that make Ultiworld possible and participate in CUT Camp! Day 1 of the Youth Club Championships in Blaine saw the emergence of a large gap between top and developing teams. Although the day was filled with blowouts across all three U19 divisions both in the morning wind and the afternoon rain, there was still drama to be found. The Mixed division saw a few teams separate themselves from the pack. In Pool B, the Bay Area Happy Cows unsurprisingly coasted to a 4-0 day on the backs of Cameron Beck and Jeremy Dolezal-Ng. After a first round bye Saturday morning, they will look to earn their bye into the semifinals, though with a tricky pair of games against Oregon and Minnesota. Oregon Flood also opened with an undefeated day, finishing 3-0 after getting major contributions from Quinn Buermeyer, Taya Norris, and Andrew Lewis. Flood have a brutal Saturday morning, taking on upstart Maine Rising Tide and then following that up with a matchup against the juggernaut that is Happy Cows. Win one of these games and Flood will almost certainly book a spot in the Championship bracket; win them both and they could head into Sunday as pool winners. Perhaps the most surprising story in Pool B was the emergence of Maine Rising Tide as a real competitor. Rising Tide gave Happy Cows their closest game of Friday and won handily over the rest of their competition — including their northeast rivals BUDA and the hometown MN Superior, the overall 4th and 6th seeded teams respectively. Tide play an effective person-defense and are good at utilizing the fast break off of turnovers. Pool A was home to mostly blowouts, but defending champs Swing Vote was once again part of an instant classic against the overall 5-seed Philadelphia Forge. You can’t talk about Swing Vote without talking about ex-Truckstop and Junior Worlds player Joe Freund. Freund makes defenses gameplan just for him, as he has the ability to win games both by cutting deep or with his throws. Forge’s Alex Atkins took the Freund matchup for the first part of the game and did a decent job containing Washington’s superstar; Freund was still able to get open consistently, but Atkins was putting enough pressure on him to make things hard for the Swing offense. Despite this pressure, both O-lines cruised through the first half which finished with Swing Vote in the lead 7-6. In the second half, Swing Vote mixed up their defenses a few times but they never found an answer for Nate Donaher who really drove the Philadelphia offense as a popper. With the score at 10-9, DC attempted a second centering pass to a receiver that simply wasn’t looking. Philly would immediately call a timeout and punch in the break to tie the game. In a brilliant coaching move, Forge came down on the next point in their first zone of the game, catching Swing Vote off-guard and earning Philadelphia a second straight break. On their second attempt against the Forge zone, Caroline Tornquist and Sean Mcsweeney were able to shred apart the zone to bring the game to universe point. Receiving the pull, Forge immediately looked deep to Eddie Scott who made an excellent catch then threw a floaty around break to Spencer Deroos for the 12-11 victory. Both teams will play undefeated Seattle — who breezed through their Friday surrendering a total of just nine points on Day 1 — on Saturday to determine the order of the top three seeds heading into Sunday’s bracket. In the Girls’ U19 division, four teams really separated themselves from the pack. Seattle, Triangle, BUDA, and Cincinnati all went undefeated on the day — and none of them really faced a challenge. The closest game any of those four teams played was a 12-6 win for BUDA over Colorado Cutthroat. The filmed game in the woman’s division featured Pool B top-seed BUDA against Neuqua Daydream. Boston proved to be a well-coached team, showing off multiple zone looks throughout the game. For upwind points, they did a good job of playing underneath their person and forcing difficult deep throws from Neuqua. Although there were skilled throwers on the team, Daydream suffered from unforced errors and an inability to reset the disc. On offense, BUDA did a good job using the width of the field and finding open spaces in the endzone with loopy throws from Clara Stewart. Kendra Griesman also had an excellent game for BUDA who would take the game 12-3. Saturday will feature matchups between Seattle and Triangle and between BUDA and Cincinnati that are very likely to determine the seeding for the championship bracket. The biggest drama in the Boys’ U19 division revolved around Pool D. It all started with Indiana’s early upset of the pool’s top- seed, Atlanta. The teams traded for most of the game until 9-9 when INferno went on a run to earn a 13-10 victory. Indiana played an aggressive brand of ultimate in which they would often look to huck within a few throws. Conversely, Atlanta was still finding their rhythm as their D-line struggled to punch in breaks. “We really didn’t worry about seed,” said Indiana captain Trey Dynes after the game as he cited energy and big plays as keys to the victory. Indiana would finish the day 2-1 after a loss to Chicago and will definitely be a team to watch going forward. Entering the much anticipated 4v5 matchup, Chicago had clearly had the better day sitting at 3-0, but it was the ATLiens that jumped out to the 7-2 halftime lead. Atlanta was simply winning the deep game on both offense and defense and outplaying Chicago with very patient offense. However, their success began to quickly slip away in the second half as Chicago ramped up the intensity at the same time Atlanta stopped connecting on shots. Dylan Power was essential for Chicago as he possessed a full arsenal of throws and wasn’t afraid to go every other. The break train continued all the way until 11-10 when a spirit timeout was taken to ensure that the game was completed honorably. Atlanta used a couple nifty scoobers to open up a huck against the Chicago three-person cup to retake a 12-11 lead. Chicago worked the ensuing possession close to the red zone, but an ill-advised shot to the end zone was blocked and Atlanta recovered their patient offense in time to put in the goal and hold on for the win. Even still, it is Bay Area Red Dawn who sit atop the Pool D pile, after quietly putting together a 3-0 day against the bottom teams in the pool. They will face a challenging Saturday with games against the top three squads where they’ll have the chance to prove themselves as a competitor for a bracket spot. Pool’s B and C were essentially locked up on Friday as Triforce and Seattle both took care of their competition and appear to have easier schedules ahead on Saturday. Triforce especially had a dominant day in which they took down the pool two-seed Colorado Cutthroat by a score of 13-2. Dean Merritt and Rhys Gretsch played well on defense on a day where the team’s stars barely saw the field. Having played only two rounds on Day 1, Pool A remains somewhat in flux. Boston BUDA and Cincinnati Flying Pig, both sitting at 2-0, will play on Saturday to determine the pool winner, though Nashville is lurking with a chance to capture a spot in the bracket despite their 14-9 loss to BUDA. Aidan Shapiro-Leighton also contributed reporting to this recap. Fred Wolf is a Youth Division reporter for Ultiworld. 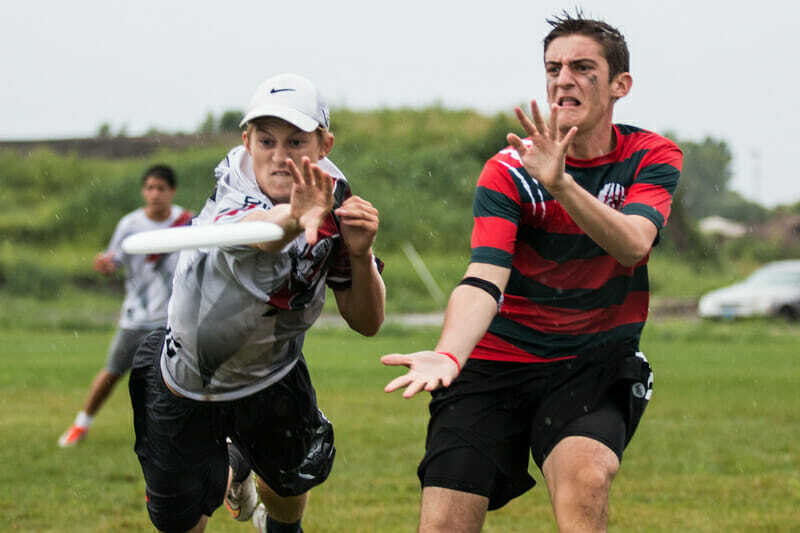 Comments on "YCC U19 Day 1 Recap, Presented By CUT Camps"